I Should Be In The Kitchen: A million projects at once! 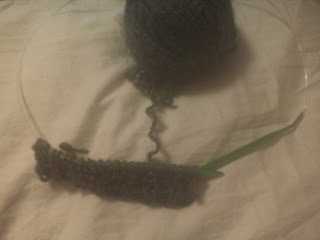 Of course I can't have just one knitting project going at one time. Currently I have on my needles: a dish cloth, a baby blanket (that I think will never get finished at this point, I lost the pattern! 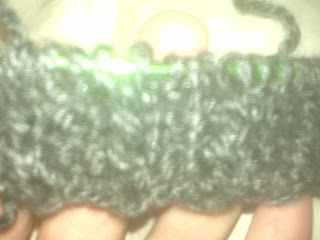 ), a cap for my brother... and I just cast on a new scarf. 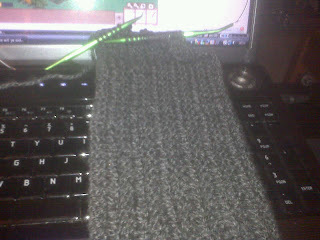 I had a lovely pattern I made up that I was knitting on for a scarf in a beautiful heather grey, but I messed it up. I miscalculated when I started and had a few more stitches on one square than another. It probably wouldn't have been too noticeable, but it was driving me mad. So I tore it all out, and am using that gorgeous yarn for a very simple (and hopefully quick) scarf I pulled off of the Yarn Harlot and so far so good. I'm loving the texture! Sorry the pictures are so terrible, didn't feel like pulling out my camera this late. Better pictures will come when it is finished!